Lance Armstrong has lost three of his main sponsors as the fallout continues from the United States Anti-Doping Agency's report into doping. Sportswear giant Nike, cycle maker Trek and Budweiser brewer Anheuser-Busch will cut ties with the former cyclist. Armstrong, 41, who has been stripped of his seven Tour de France titles, has also stepped down as chairman of his cancer charity Livestrong. The three companies pledged to continue to support Livestrong. Nike said in a statement "due to the seemingly insurmountable evidence that Armstrong participated in doping... we have terminated his contract". Anheuser-Busch will not renew its sponsorship deal with Armstrong when it finishes at the end of 2012, while Trek is ending its long-term relationship with the American with immediate effect. Another of Armstrong's sponsors, sportswear firm Oakley, said: "As we have stated in the past, Oakley does not approve in any way the use of illegal substances for enhancing performance in sports. "Our policy with our athletes is to support them until proven guilty by the highest governing body of sport or court of law. We are reviewing the extensive report from the Usada, as well as our relationship with Lance, and will await final decision-making by the International Cycling Union." The decisions come a week after the United States Anti-Doping Agency (Usada) released a report containing accusations of widespread doping by Armstrong and his teams. It contains sworn statements from 26 witnesses, including 11 former team-mates. Usada ordered 14 years of Armstrong's career results to be erased. The American has always denied doping, but gave up his fight against the charges in August. Nike, which added that it was "misled" by the American for more than a decade, made a U-turn on a statement released last week when it said it would "continue to support Lance and the Lance Armstrong Foundation". Nike and Armstrong had been in partnership since 1996. Armstrong also announced on Wednesday that he would be quitting his role as chairman of his cancer charity in order "to spare the foundation any negative effects as a result of controversy surrounding my cycling career". "Armstrong's comeback from cancer to dominate the world's toughest bike race was such a wonderful story that people want to believe that it is true. So great a hero was he to so many that some are still reluctant not to." The Texan will remain on Livestrong's 15-member board, with vice-chairman Jeff Garvey, who was founding chairman in 1997, taking over Armstrong's role. Armstrong added: "As my cancer treatment was drawing to an end, I created a foundation to serve people affected by cancer. "It has been a great privilege to help it grow from a dream into an organisation that today has served 2.5 million people and helped spur a cultural shift in how the world views cancer survivors." Livestrong spokesperson Katherine McLane told BBC Radio 5 live: "I think he reached this decision because he holds this organisation close to his heart and he thinks of this as akin to one of his children in terms of how deeply he cares for it. "Surprisingly throughout the last few years, with these issues being in the news, we've seen an increase in the number of people that support (Livestrong) and contribute." Former England footballer Geoff Thomas was inspired to set up his own foundation after reading Armstrong's autobiography days after being diagnosed with chronic myeloid leukaemia in 2003. Armstrong led the tributes when Thomas was awarded the 2005 BBC Sports Personality Helen Rollason Award in recognition of his charity work, but Thomas said the American "had done the right thing" by stepping down as chairman. "I think it's damage limitation while everything is going as it is - there's a news story about Lance every day," the 48-year-old told BBC Sport. "Lance stepping down will probably take the heat away from the charity itself and put the focus solely on him." 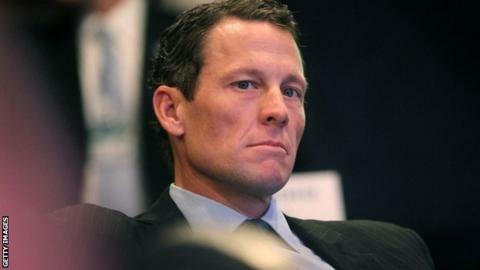 Thomas contacted Armstrong on Twitter, writing: "@lancearmstrong please for your sake, come clean. If not yours, for the millions you have inspired over the last 15+ years."